I was THRILLED to discover your website this morning as I am researching an upcoming exhibition about early American racing for Heritage Museums & Gardens.. .We have a Vanderbilt Cup painting (image attached) which we have been a quandary about for some time since we didn’t know who the artist was. Now we do thanks to your website! It looks to me like this is a copy of the poster Jean de Paleologue did for the 1908 race. The plaque on the frame says “George Robertson, driving a Locomobile, winning the fourth Vanderbilt Cup, held on Long Island, October 24, 1908. Presented to the club by Jefferson DeMont Thompson.” We do not know the name of the club referred to on the plaque. The painting is very large (about 4 feet by 6 feet, framed) and the medium is oil on canvas. I thought you would be interested in seeing this painting. Thanks for your terrific website! Jennifer, I'm thrilled too! Your painting on the left almost matches the Jean Paleologue 1908 race poster (above) with very slight variations. One clear difference is Paleologue's PAL signature on your painting (left) versus the PAL signatures on the lithograph and program guide (below). In reference to the inscription on the painting, it is obvious the copy was wrong and did not depict "George Robertson, driving a Locomobile". The painting was completed prior to the 1908 race since it was used for the official program guide (left). Moreover, Robertson's winning Locomobile was "Old 16" not "Old 7". The rest of the inscription; "Presented to the club by Jefferson DeMont Thompson is intriguing. Jefferson DeMont Thompson was a prominent New York real estate developer and served as president of the Broadway Association, which guided the development of the Times Square area. Similar to his friend, William K. Vanderbilt Jr., he had a passion for automobiles, racing and advancing transportation. In 1906, Thompson was chairman of the AAA Racing Board and chairman of the Vanderbilt Cup Commission. Here , he was seen on the 1906 course (right) conferring with Willie K. and A.R. Pardington (center). Following the 1906 race, Thompson was also heavily involved in the planning and development of the Long Island Motor Parkway, serving as a director and its first treasurer. At the June 6, 1906 ground-breaking ceremony, Thompson was standing in the center of the podium wearing the long white coat. For the 1908 race, Thompson returned as chairman of the Vanderbilt Cup Commission. In this capacity, it is quite possible that Thompson commissioned Paleologue to paint the official race poster and had the authorization to donate it to a "club". As a well-connected New Yorker, Thompson was involved with many clubs including; the Automobile Club of America and the Aero Club, where he also headed a special aviation section for the New York City Police. Jean de Paleologue (1860-1942) was born in Bucharest, Romania. He was a distant descendant of Manuel Paleologue (Palaiologos) who was brother of Constantine XI, the last of the Byzantine Emperors. Jean de Paleologue was a real prince! After living in London, he moved to Paris in 1893 and was known for his posters of beautiful women. In 1900 he moved to the United States and worked in applied graphics including Vanity Fair. Later he developed ads and publicity for the automobile, film and animation industries including his commission for the official poster for the 1908 Vanderbilt Cup Race . In November 1910, "Cycle and Automobile Trade Journal" called him "the greatest living poster artist". Prince Paleolgue died in Miami at the age of 82 leaving his fourth wife and a son, the last of the line, Prince Ion Alessandro Paleologue. In conclusion, I believe the 1908 PAL oil painting at the Heritage Museums & Gardens was painted by Prince Jean de Paleologue. 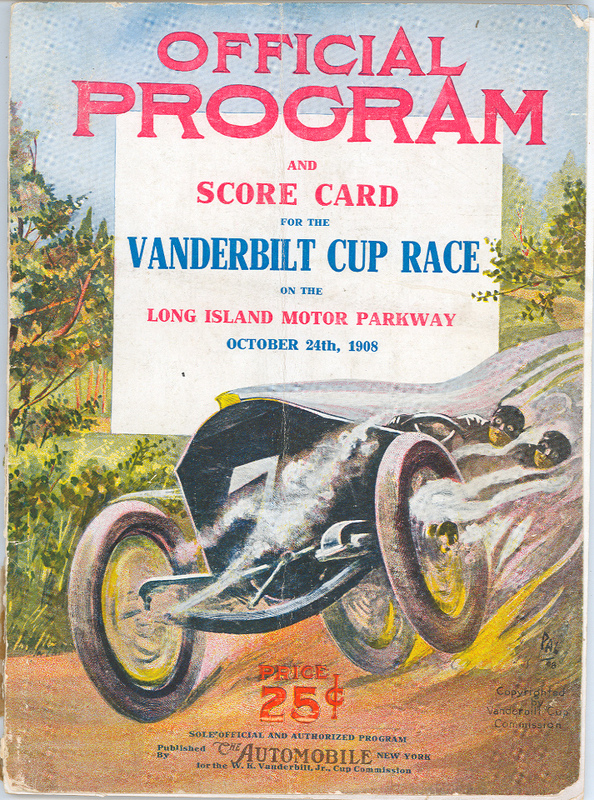 It was probably a preliminary painting that was used in the development of the 1908 Vanderbilt Cup Race poster. It was also likely donated to an unknown club by Jefferson DeMont Thompson in his capacity as chairman of the 1908 Vanderbilt Cup Commission. I cannot wait to visit Cape Cod to see it!! Absolutely fantastic stuff! I love this web site—one of the best I visit. Thanks for the feedback!!! Much appreciated. I read with interest this last biographical entry. My maternal grandmother, born in Paris in the 1870s, was born a Paléologue, a sister to Maurice, the last ambassador to Tsarist Russia and member of the French Academy who never married. Their family of Greek descent also originated in Romania, but it is well-known that the royal Byzantine Paleologos line was extinct. So much for titles and provenance, usually created to impress American hosts. Jean de Paléologue may have been a distant cousin; regrettably no one surviving in our family seems to have any information on him. Our Paléologue family made its fortune in Romania, I’m told, in commodities and shipping in the nineteenth century, but the siblings emigrated to Paris where they either married well or achieved distinction in diplomacy and letters. They integrated themselves well into French culture and society, but remained true to their Greek Orthodox faith.